Feng Shui is part of the Chinese medicine system. Developed in China over 3,000 years ago, Feng Shui (pronounced Fung Shway) is as viable today as it was at its inception. Its wisdom and power have only recently been introduced and embraced in the West. A multi-level practice, we can all benefit from understanding and practicing any aspect of this beautiful teaching. Feng Shui is a process that can be embraced for life. It is not intended as a one-time fix but as a support system for perpetual discovery, self-awareness and improvement. Download this free printable and enjoy this Feng Shui inspiration. Feng Shui is the study of how human beings interact with their environment and the energy patterns (or Ch’i flow) that result. Our environment expresses and holds the essence of who we are as a person. Therefore, if we want to improve or change our lives, we can consciously change the environment to support the achievement of our goals and desires. We all know when we walk into a room that “feels good” to us, but may have a harder time figuring out why a space doesn’t feel good. Balancing extremes and producing a setting that brings the greatest harmony to the individual is the goal of Feng Shui. It provides a system to decipher the causes of imbalance and offers specific guidance on changes to make so every space we occupy feels like heaven on Earth. The goal is to create an environment that suits you and supports you to improve your life. Here are the fundamental tools that you, as a budding Feng Shui practitioner, can utilize to achieve a balanced environment. Ch’i (pronounced Chee) is the vital, living energy that is in us all. It is invisible but always present. Translated “breath” or “energy”, we are balanced and vibrant when infused with the right amount of this beneficial energy. Like Goldilocks, we want Ch’i to flow “not too fast, not too slow, but just right.” Beyond Ch’i in each human being, Feng Shui teaches that everything possesses Ch’i, and the quality and quantity of that Ch’i energy is defined by its form. A moldy pile of old newspapers is exhibiting depleted, stagnant Ch’i while a healthy plant in full bloom is exuding vibrant, nourishing Ch’i. Which would you rather be around? A foundation principle of Feng Shui is that everything is connected. What connects us is invisible, living, ever changing Ch’i energy. A goal of Feng Shui is to arrange your environment so that it provides you an ideal amount of beneficial Ch’i. Yin and Yang (pronounced “yong”) are the two complementary opposite forces that govern the universe, and can be utilized to describe and analyze all aspects of life and matter. One cannot exist without the other, but we are always striving for a supportive blending of the two. When there is imbalance, whether it is in design, health, emotions, etc., it is useful to evaluate the situation by determining whether it is predominantly Yin or Yang. Add the opposite characteristic to help to restore harmony. The goal is to balance Yin and Yang since a majority of humans are most comfortable when a balance is struck between the two. The Elements define the five types of energy that constitute all matter. They include Wood, Fire, Earth, Metal and Water. Human beings are made of all five elements and are usually most comfortable in an environment where all five are represented. The Elements also demonstrate various patterns of change including nourishing, restraining and depleting cycles. This rich knowledge is utilized not only in Feng Shui but Traditional Chinese Medicine as well. On a broader scale, it can be used to decipher likely outcomes in most activities of humanity. Originating from the I’ Ching, an ancient Chinese book of Divination, the Bagua is considered a roadmap or treasure map. It is a grid, similar to a tic-tac-toe board, that is superimposed over your floor plan, dividing the structure into nine separate areas. Each area, or gua, represents a specific area of life – Health and Family, Wealth, Fame, Relationship, Creativity and Children, Helpful People and Travel, Career or Knowledge and Self-Cultivation. The full and vibrant expression of each of these areas will lead to a more harmonious life. As a roadmap, the Bagua can detect current life situations by pinpointing imbalances in individual guas. As a treasure map, a meaningful object of your choosing can be placed in a gua to set a specific intention for the future. Employing the wisdom and power of the Bagua can unleash insights and opportunities you never thought possible. It is exciting to be introduced to the potential of Feng Shui. Your eyes open to a new awareness, one of realization, knowing and potential. Acknowledging and investigating the environment around you leads to expanded realizations about its influence upon you. Knowing this information and coupling it with the wisdom of Feng Shui reveals a new potential, one where you can partner with your environment to improve your present circumstances and put forth the intention for a future of your dreams. Join me on a Feng Shui Adventure! Hi, I’m Carol Daigneault, a Certified Essential Feng Shui® Practitioner since 2001. Join me to experience what I’ve taught my many clients over the years, and you can begin using Feng Shui today to enliven and improve your life. 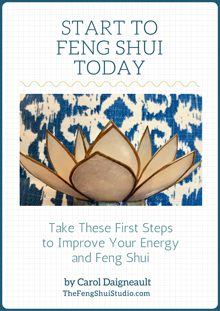 Download now and begin your practice of Feng Shui with this FREE 7 Step guide that will give you what you need to Start to Feng Shui Today. Our outer and inner worlds are connected. This 48 page book will give you background and techniques to create the vibrant Inner Feng Shui of peace and harmony. Feeling stuck or confused? Start to shift the congested, disorienting Ch’i energy of clutter with this FREE guide, Feng Shui Clutter Clearing Tips. Clutter Clearing can bring fresh, vibrant, focused energy to your home that will enhance any area of your life. Our outer and inner worlds are connected. This 48 page book will give you background and techniques to create the vibrant Inner Feng Shui of peace and harmony. 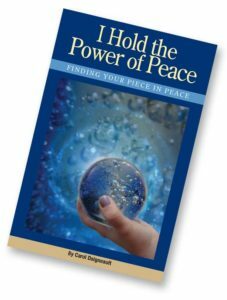 You can Hold the Power of Peace. Feeling stuck or confused? Start to shift the congested, disorienting Ch’i energy of clutter with this FREE guide, Feng Shui Clutter Clearing Tips. Clutter Clearing can bring fresh, vibrant, focused energy to your home fast. This energy can enhance any area of your life. 7 Specific Steps You Can Take To Improve Your Energy, Your Home, and Family. Find Out Where On Your Home Is Your “Mouth of Chi” And How To Make It Welcoming & Inviting.